Corneal topography is a non-invasive medical imaging technique for mapping the surface curvature of the cornea, the outer structure of the eye. Since the cornea is normally responsible for some 70% of the eye's refractive power, its topography is of critical importance in determining the quality of vision. Topography measures thousands of points and makes a digital map. This three-dimensional digital map is a valuable aid to our doctors and can assist in the diagnosis and treatment of a number of conditions. Planning refractive surgery such as LASIK, monitoring diseases of the cornea, such as keratoconus, or in assisting in the fit of contact lenses. 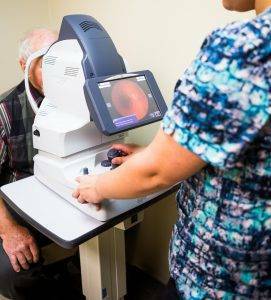 We use cutting-edge digital imaging technology to document your eye health. Many eye diseases, if detected at an early stage, can be treated successfully without total loss of vision. This is very important in assisting our doctors to detect and measure any changes to your retina each time you get your eyes examined, as many eye conditions, such as glaucoma, diabetic retinopathy and macular degeneration are diagnosed by detecting changes over time. 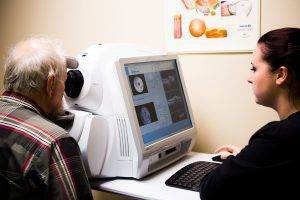 Digital Retinal Imaging assists our doctors with the evaluation of the health of your eye. It can document conditions on or in the eye, and is performed on subsequent visits for comparison with previous images. An Optical Coherence Tomography scan (commonly referred to as an OCT scan) , and taken like a picture of the eye, is the latest advancement in imaging technology. Similar to ultrasound, this diagnostic technique employs light rather than sound waves to achieve higher resolution pictures of the structural layers of the back of the eye. A scanning laser used to analyze the layers of the retina and optic nerve for any signs of eye disease, similar to an CT scan of the eye. It works using light without radiation, and is essential for early diagnosis of glaucoma, macular degeneration and others retinal diseases. A visual field test measures the range of your peripheral or “side” vision to assess whether you have any loss of peripheral vision or visual field abnormalities. This is done using a computer, and usually only takes about 20 minutes.